Bright colours are popping up everywhere, from clothing and jewellery, to area rugs and pillows! Big, bold colours are all the rage and colour blocking is a 2012 trend we are going to see get stronger through 2013. A throwback to the mod 1960’s, this modern interpretation is fresh and exciting. Use oranges and corals mixed with aquas and teals in accessories, rugs and paint- and keep wood tones natural for a funky vibe. 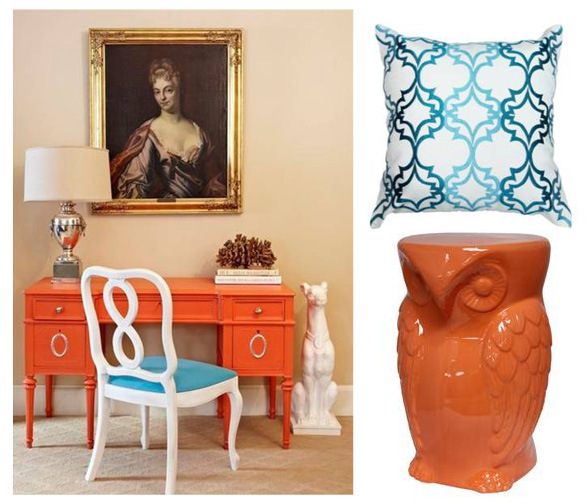 Get the look with brightly coloured side tables and fun throw pillows. Bold area rugs on a neutral floor create a vibrant look without being too overpowering. This great room from Urban barn, along with their accessories is a fantastic use of colour blocking. The cheeky owl and quattrefoil patterned throw are easy additions to your space! Have fun when you are shopping, buy that funky bright blue lamp and don’t be afraid to mix and match it with your current colours- grab some yellow and red throw pillows that you don’t normally think go together-be bold! Next Post Tell us your favourite design and win!